While they don’t have some of the smart fitness features you get in the likes of the Lifebeam Vi or Jabra Elite Sport, the SoundSport Free are comfortably the best sports headphones for pure music enjoyment. They’re comfortable enough to wear for hours on end, and can last an impressive five hours outside their charging case. In the wire-free market there tends to be something of a compromise required to get the type of performance or design that you want. If you want great sounding audio and stylish looks, you have to sacrifice battery life and get the Sony WF-1000X. If you want a secure fit for running and good battery life, you opt for the Jabra Elite Sport and end up being a little uncomfortable. Finally, if you want small, lightweight earbuds that are super convenient, you sacrifice sound and opt for the Apple AirPods. Or do you? What if you could get a pair of wire-free earbuds without any major compromise? That's what Bose promises with the SoundSport Free. The company says you'll get great battery life, a secure enough fit for running or working out, without discomfort, and you get great sound and connectivity too. Does Bose over-promise, or are the SoundSport Free the wire-frees to beat? Let's get this one little hurdle out of the way first: the SoundSport Free earphones look a bit weird. They stick out of your ears in a manner that no other earphones do. Like their wired predecessors, there's no way to wear them discretely, unless you have long hair to cover them. The plastic housing is quite bulky for in-ears, too. Despite this, they're supremely comfortable to wear. This comes down to the ear tips used. 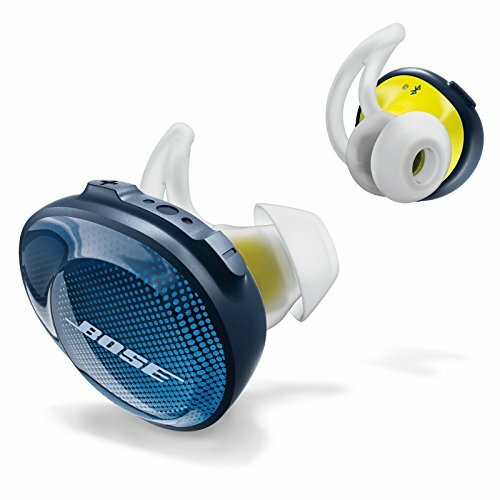 As with the previous-generation SoundSport, Bose fits the Free with the StayHear+ Sport tips. These are silicone ear tips and sport fins that are joined together in one piece of flexible, soft silicone that fit over the earbud. The Free has miniature cone tips that are tapered in a way which means they form a seal with your ear canal, without needing to be shoved deep into them. They're comfortable and not intrusive. It's a testament to Bose's design team that an earphone can be very securely attached to the ear without feeling tight, and without needing over-ear hooks. However, because the fit isn't super snug, at first it was initially a little disconcerting, as we felt like they would easily become dislodged. We soon got over that anxiety though. We tested the SoundSport Free on a handful of workouts, including some rough downhill runs, which took us down steps, along some bumpy trail routes through a forest, and these in-ears remained secure the entire time. As an aside to this: if the default StayHear+ Sports tips don't work well for you, the earphones ship with two other sizes to try. Thanks to the material used, they're flexible and soft enough not to bother. The outer plastic is glossy, featuring an attractive pattern - in black and blue on our review pair, with a bright, luminous yellow on the inside. Y'know, just so you're absolutely sure these are for sporty types. Around the rim is a grippy rubberised finish, which makes sense given this is where you'll find the physical buttons. On the right earbud you'll find the protruding volume up and down buttons, separated by a recessed play/pause button. While these are easy to find, thanks to this design, they're not so easy to press. There's not much in the way of tactile feedback or button travel, so you're never 100 per cent sure if you've pressed one successfully. At least, not for the split second it takes between pressing and the relevant action taking place. It's similar on the left earbud where you'll find the Bluetooth pairing/status button. For those of you worried about sweat or rain damage, you'll be pleased to know that Bose has built in a protective membrane in the SoundSport Free. With IPX4 certification ragainst water, these in-ears can survive just fine during your hottest, sweatiest workouts and in your rainy outdoor sessions. As for the charging case, while it's a little on the large side, its design is generally well considered. Inside you find the two perfectly shaped slots for slipping in the earbuds, with charging points made up of four small connectors flanked by two magnets. Even when held upside down and shaken these connectors hold well to the earbuds, ensuring the fit is secure. Similarly, when closed, there's a latch released by pressing firmly on the long pill-shaped button on the outside which, pleasingly, can also illuminate the battery indicators on the outside. Unlike some of the modern, wire-free or sporty headphones we've tried, the SoundSport Free and its accompanying Connect+ app (for iOS or Android), is a little limited allowing only for volume adjustment, track pause/skip (even if you're using Spotify) and battery level observation. There's no fitness tracking element, and no manual or pre-set equaliser settings to choose from. That doesn't mean it's not a smart and useful app though. It's designed for controlling all manner of Bose products - from these in-ears to the QC35 on-ears, portable speakers and sound systems, and the features it can activate/control change on a product-by-product basis. After installing the app, it can automatically detect when there's a Bose product in the vicinity, knows what it is, and displays the relevant icon on screen. To pair/connect, it's simply a case of dragging down on the picture of the product that just magically appears on the screen. After pairing, you can choose a name for your earphones, or skip through some random suggestions until you find one you like. Within the settings menu, you can change its name and take a product tour - which is really useful for discovering what the buttons do. You can also change the standby timer - which essentially tells the SoundSport Free how long it should stay powered on for before switching off when no longer in use and outside of its charging cradle. There's an option for activating voice prompts for notifications, as well as product info and a user manual. One cool feature that's designed specifically for the SoundSport Free is the "find my earbuds" function. If you've taken your earbuds out of the case and forgotten where you've put them, or lost them somewhere, you can - you guessed it - use this function to find them. It shows you where they were last seen on a map, and - once within Bluetooth range - gives you the option to get either one, or both earbuds to play a sound which gradually increases in volume to help you locate them. Bose promises up to five hours of music playback from a fully charged pair of SoundSport Free earphones, which is pretty much the performance we were getting from them in our testing. In fact, if anything, the estimate is conservative. Removed from the case, between one and two hours of music playback decreased our battery level from 100 to 80 per cent. After two-and-a-half hours, the battery showed as down to 60 per cent. It's worth noting, the level rounds to the nearest 10 per cent, so it's difficult to get exact feedback. As wire-free earphones go, the Bose is one of the best performing we've used to date. They're comfortably longer-lasting than the Sony WI-1000X, and even top the 2017 edition of the Jabra Elite Sport. As for the charging case, that has enough juice to give you two extra full charges which, in theory, means you get up to 15 hours of battery life in total after plugging into a power source. Connectivity is also strong. Not once during testing did these earbuds lose connection with the phone, or with one other. What's more, automatic and reliabe connectivity every time we removed them from the case is a great feature. If you've listened to Bose earphones before, you'll know the kind of sound to expect. You'll also know that there's not really any way to change what you get. Bose's sound is the one it wants you to hear. That means very easy listening whatever you choose. Most genres of music sound really nice through these sporty earphones. Whether you're listening to acoustic pop from the likes of Gavin James, rocky tracks from Catfish and the Bottlemen, classic Notorious B.I.G, Haim or Paramore, then you'll enjoy them a lot. So much in fact, that you'll happily wear them even when you're not running. Bose has implemented what it calls "volume-optimised EQ", which means you get good quality sound whether you have them at low volume, or pumped all the way up, and there's little in the way of distortion. Bass and mid-tones are nice and full, without dominating, so you can still hear high notes and vocals clearly, while the rest holds it up in the background. It's warm and enjoyable, without being overly wooly, and details are clear and audible without being harsh or sterile. It's a nice mix, although bass-heads might want a bit more of a boost on the low end. Listening to some bassy hip-hop tracks, or grungy metal sometimes leaves you just wanting that little bit more grunt. Along with that, if we were being really critical, there could maybe be a tiny bit more clarity. While the Bose doesn't have some of the smart fitness features you get in the likes of the Lifebeam Vi or Jabra Elite Sport - no heart-rate or cadence measure - we'd still comfortably call the SoundSport Free the best sports earphones for pure music enjoyment. With a design that's not too embedded within the ear, these buds are comfortable enough to wear for hours on end, won't fall out, plus the battery life of five hours per charge (and two charges in the accompanying case) means they can last an impressive 15 hours total. In short: the SoundSport free is fantastic. If you want a pair of wire-free sports earphones that also pack in some activity-tracking features, the Jabra Elite Sport are a good alternative. There's a heart-rate monitor and, along with a smartphone app which can track your runs using your phone's GPS, while also offering superb connectivity performance. What Sony offers, that the Bose doesn't, is a more attractive and subtle design. There's also get ANC (active noise-cancelling), plus customisable sound. Just don't expect the Sony earbuds to work as well during exercise, as the Bose has a better fit. If the wire-free part doesn't concern you too much, then the Beats Powerbeats 3 Wireless is a great alternative. Considered by many as the go-to pair of workout earphones, with hooks to keep the earbuds in your ears, the sound is enjoyable, and the battery goes for 12 hours. If you're an iPhone user, the W1 Chip makes the Beats super convenient to pair and connect too.